It started with digging. It always starts with digging. At some point the Defensive Player of the Year Award became an offensive award. Damion Lee was on the All Defensive team. Damion Lee’s Coach wouldn’t have voted for him. Most of his fans wouldn’t have voted for him. It’s beyond likely that Damion Lee wouldn’t have voted for Damion Lee. Yet there he was. Defensive metrics are hard. So one must dig. As digging goes, what is below is lightweight work. It began without looking for a DPOY candidate, but rather for a completely different story. It began with questions. When the Dragons defense was performing well, were they turning their opponents over more? Were they playing faster or slower? Is it a home/road thing? When they had difficulties was there a signal as to why? 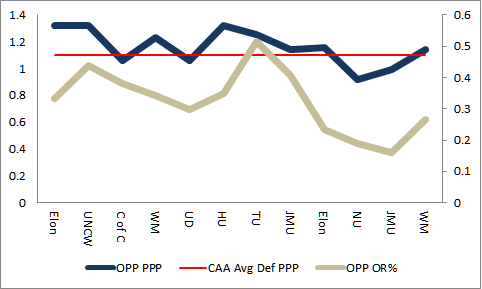 Shown here is the relationship between Austin Williams’ minutes and points per possession allowed by the Dragons. 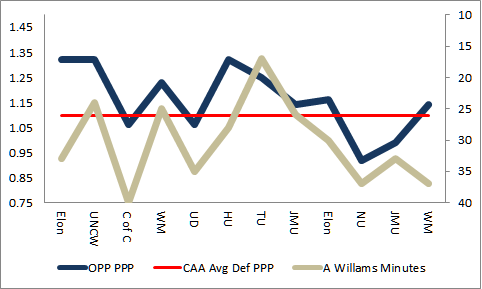 And what one finds is that neither turnovers, rebounds, fouls, tempo or anything else that was reviewed correlated more with Drexel defensive performances than Austin Williams simply being on the floor did. “Stretch”, as his coach refers to him, makes his team better in every single metric. Four times this year he has played at least 35 minutes. Those are the only four games where the Dragons have been a better than league average defense. His ability to block shots (Austin is the number one shot blocker by rate and total in the CAA and the City of Philadelphia) and work the defensive glass is the ultimate safety valve for his teammates. When he becomes part of the transition defense, as he did with his walk-off block against James Madison, he can be a one man fastbreak stopper. Coach Spiker said after the Northeastern game: “Stretch… [is what]a fourth year player looks like in league play for a successful program.” He is the most valuable defensive player in the league to his team, and the Defensive Player of the Year voting should reflect that. And so as Towson follows the Eagles into town on Thursday, the question for Drexel coaches has to be how to defend when Austin is not in the game. How to make the team less dependent on the monster in the middle that is Stretch. There’s a number of ways to do it, but noting that the second closest correlation to defensive performance is rebounding, it may start and end there. Five guys, crashing the defensive glass, totally unconcerned with the idea of getting out in transition. Making rebounding the first priority not only secures the defensive end but also slows the game down and minimizes the possessions that Austin has to sit for. It’s a simple and easy start solving a complex problem that continues to be a challenge for this team. When a strong force is removed from an environment it will cause a vacuum. And Austin Williams is that force for Drexel University men’s basketball.